Mr. Masaaki Tsuya has served Bridgestone Corporation for 36 years and has been CEO and Representative Board Member since March this year. Born in 1952, Mr. Tsuya joined Bridgestone Tire Co., Ltd. (Now Bridgestone Corporation) in 1976. After serving several years from 1998 as General Manager, Office of International Relations, and moving to a position of Vice President and Officer, Group CEO, in 2006, he became a member of the Board in March 2008. From 2008 his responsibilities have included the roles of Chief Risk-Management Officer; Chief Human Rights Officer; Diversified Products, Sports and Cycle Business; Corporate Administration; Chief Compliance Officer, Office of group CEO, Internal Auditing. The Bridgestone Group (Bridgestone Corporation and its consolidated subsidiaries) is the world´s largest manufacturer of tires and rubber products. Bridgestone Corporation was founded in 1931 in Japan and today, the Bridgestone Group has manufacturing plants in 25 countries and sells products in over 150 countries worldwide. Tires account for about 80% of consolidated sales, with the remainder made up of a wide range of industrial and consumer products which includes bicycles and other sporting goods. The Bridgestone Group mission of "Serving society with superior quality" mandates an unending quest to create higher value added products worldwide to fulfill various social requirements and market needs. A key challenge is to stay at the forefront of technology in each business domain in order to achieve a goal for the Bridgestone Group to be recognized as the world´s undisputed No. 1 tire and rubber company in both name and reality. R&D programs in the tire segment share the fundamental aim of creating tires that deliver higher added value. Besides seeking performance gains such as increased grip or durability, the Bridgestone Group also strives to develop tires that are safer, provide more comfort and could make an environmental contribution. The Bridgestone Group recognizes runflat tires as strategic products, which continue to function safely at a specified speed for a specified mileage even after loss of air pressure. This vastly improves safety in the event of a sudden loss of pressure as with a puncture. Bridgestone Corporation has developed a new technology called "COOLING FIN" that enhances the post-puncture durability of sidewall-reinforced runflat tires. The use of fins promotes increased air turbulence to help cool the tire sidewall, which heats up when driving at lower tire pressures. This new technology paves the way for developing runflats for vehicles such as minivans, large passenger sedans and some SUVs, which generate greater sidewall heat at lower tire pressures. Reduced environmental impact is another key goal. R&D activities aim to further reinforce this domain as a core strategic product group and business. 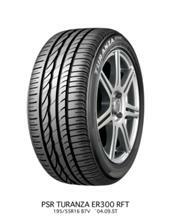 In tires, examples include our development of runflat tires, which help to reduce vehicle weight by eliminating the need to carry a spare, promoting better fuel economy while helping to conserve resources, and of the ECOPIA brand of energy-efficient tires, which can cut CO2 emissions substantially through enhancing fuel efficiency by reducing rolling resistance. In Diversified Products operations, one example is EVA (Ethylene Vinyl Acetate) film, which is a critical component of renewable energy photovoltaic systems. Bridgestone Corporation has also succeeded in developing electronic paper, which has significant potential to conserve energy and reduce paper consumption. In 2007, the Bridgestone Group acquired US-based Bandag, Inc., a leader within the retreading industry. Retreading involves re-using a tire´s casing or body several times by attaching a new tread to its surface. Retreading not only helps to reduce the total cost of tires, but also makes a major environmental contribution in terms of the more effective utilization of natural resources.